Walking as a real health promoting activity is often dismissed because of its simplicity. Many of the heavily promoted weight loss products that focus on physical activity are bias towards HIIT or more extreme activities. Of course intensive exercise will increase your metabolism and promote weight loss but what about walking? Walking has many benefits including increasing the metabolism. Anyone who is ambulatory can benefit. As your fitness improves you can increase your walking to a jog or a run. 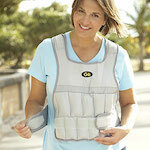 Fast walking or wearing weighted walking vests will also continuously improve your fitness level and metabolism. Walking is great for the mind and body. One of the sure signs that your fitness level is improving is by noticing that the same activity is now easier to do. This is because the heart muscle is also getting a workout and as you work it you also improve your endurance. This means that your heart won’t be working as hard as it was when you first started. To continue increasing your fitness level then you have to make the activities you do more difficult. This can be done by increasing the intensity of your walk to elevate your heart rate during your walk. This can be done by going faster and increasing the speed of your walk or adding hills or stairs to your walk. You can also add weights. Try walking up the hill in the snow. That’s a real workout! 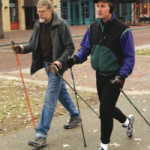 One of the best walking methods that you can do year-round and will improve the metabolism is called Nordic Walking. The more you do, the more your body adapts. Stamina increases and it becomes more and more of a challenge to keep your heart rate up into the chosen exercise zone. When a person gets to this point they often begin to jog. Not everyone can jog though. Over the years of being overweight or just aging, the joints take a hit. Back, hips, knees, and ankles all need to be healthy to allow a person to become a jogger. If you can’t jog but want to continue to improve your cardio abilities there are other activities you can do. Cycling, swimming, and rowing are three activities that really give you a tremendous cardio workout. There are stationary machines that allow you to mimic cycling and rowing plus other machines like the elliptical that will provide excellent benefit without overly stressing the joints. If you find that you have a sluggish metabolism then definitely you will benefit by adding walking to your day. However, there are a few things that you might also be doing that is working against you that you might not be aware of. One common thing dieters do that will slow the metabolism is cutting out too many calories and the WRONG calories. The rapid diets often are all about cutting calories and within a couple of days a person’s metabolism will slow right down. This is because, with or without you, your body is going to try and survive. If you won’t feed it what it needs, it will go into survival mode which includes slowing the metabolism. A healthy diet consists of real food and balanced meals and snacks throughout the day. Another issue can be not enough sleep or not getting the rest you need. When beginning a new exercise program many people expect they should be “energized”. If the program is just a daily walking program then you will notice an increase in energy. If the program is strength training and heavy cardio activity, then for the first couple of weeks you will likely feel more tired. This is temporary but does require that you pay attention to your body and get the necessary rest. It is during times of rest that the muscles get the chance to grow and repair. IMP* Lack of adequate rest can slow the metabolism. The absolute best way to increase your metabolism is to combine these three ingredients. These three will effectively turn your body into a metabolic furnace so you can replace your fat with lean muscle and reach your weigh loss goals. Updated January 11, 2019 Filed Under: Walking Fitness, Walking off Weight Tagged With: increase metabolism. I am 86 and planning a three-week trip with my two daughters this coming May and June so I need to be in better condition. This week, started my new regime: 1200 calorie diet with no sugar, butter, coffee, or creams, but instead a healthy balanced diet with fruits, veggies, egg whites and one yolk, one slice grainy bread, chicken or lean pork, fish, lentil soup or similar and 1 C skim milk. My walking is up the hill and back or on the treadmill, both of which involve forty minutes. 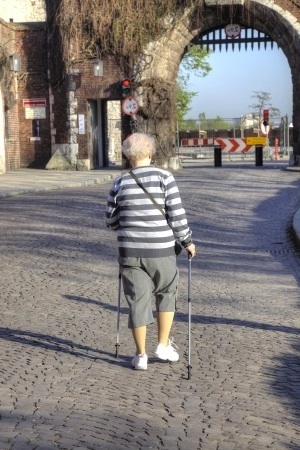 Recently, my less than good balance means I need to use a cane but I’m going to investigate the Nordic walking stick. I have a blank book in which I notate what I eat and check off important things during the day like bed exercises in the morning, walking 40 minutes, practicing the piano one hour, and of course weight measured first thing in the morning. The big surprise is how the endorphins are making me feel so happy that I can already see and feel the difference after only one week, and just knowing there is something I can do to improve my stamina so the vacation will be a pleasure to me AND my travel mates. Thank you for your website. It supports all my findings and more. Hello Mary Ellen, Thank you so much for sharing your thoughts and fitness routine with us. I am glad you find the website helpful. I think you will be very happy with a set of Nordic Walking sticks. Just make sure you have them measured correctly for best support and comfort.